Simple cooked and shredded Brussels sprouts are one of the world’s best vegetable dishes. They round out any cold-weather meal perfectly, and they are also great blended into pilafs and other grain dishes, such as this quinoa salad and herby brown rice. You can cook them until they are just wilted, and still have some firmness to the texture, or really allow them to cook down and get almost melty. Heat a large skillet over medium-high heat, and add the olive oil. Add the onions and sauté for 3 minutes until tender. Add the slivered Brussels sprouts, season with salt and pepper, and sauté for 5 to 10 minutes, until the Brussels sprouts are wilted, or as soft as you would like them. Serve hot or warm. Don’t forget that they will shrink down as you cook them, so start with a larger amount than you might think necessary. One pound will feed 4 people, approximately, and you can multiply as needed. Pre-shredded or slivered Brussels sprouts are readily available in bags or containers in many supermarkets, especially during the fall and winter months. If you want to sliver them yourself, it does take a little time, but they will be super fresh, and some of us find it therapeutic. Use a good sharp knife or mandolin, just be careful to watch your fingers! Leftover shredded Brussels sprouts might be used with all kinds of cheese in a quesadilla, or added to stir fried rice. When making these Brussels sprouts, we recommend using a skillet. A great skillet is one of the most important cooking tools in a well-supplied kitchen. It doesn’t have to cost a fortune, but buy one that’s heavy so it won’t warp, and make sure it can travel from oven to stovetop without any damage. This will allow you to sear meat, for example, and then finish cooking it in the oven. Finding a skillet you love is an incredibly satisfying achievement - it will be your friend for life. 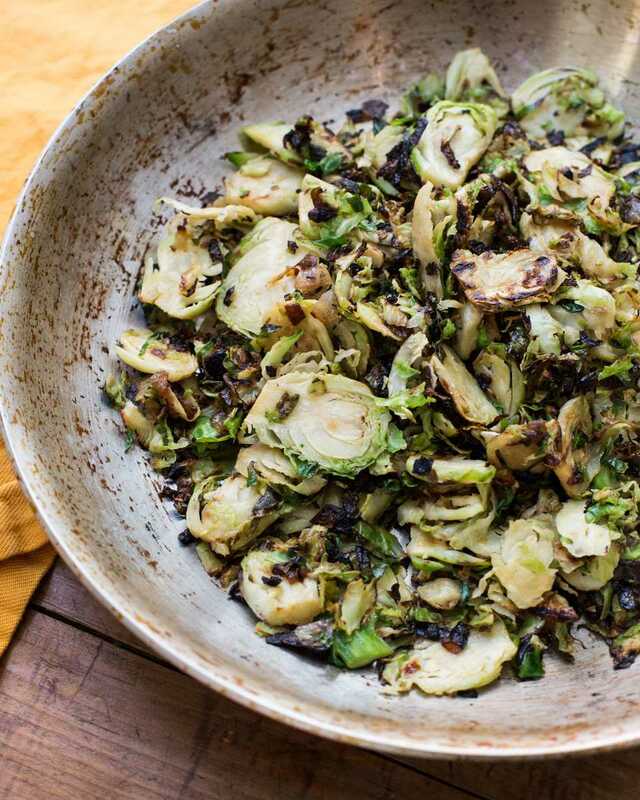 This recipe for simple sautéed Brussels sprouts and onions would pair beautifully as a side dish to a variety of entree options. For a straightforward menu, pair this dish with this sesame ginger salmon recipe or these grilled prosciutto wrapped pork chops. Also, the simplicity of these Brussels sprouts would easily compliment a more flavorful chicken dish, like this slow cooked oven baked BBQ chicken, green peppercorn and dijon chicken cutlets, Thai chicken burgers, smokey chipotle chicken salad, or hoisin glazed chicken breasts.